I know how Professor Ford is feeling now, something similar happened to me 3 years ago. I reported mine early, at first everyone was saying how they believed me, then a few weeks later they were calling me a liar . After that incident I decided that it's best not to tell anyone, because you're automatically a liar in everyone's mind. I don't trust anyone to help me, or even care,and they all determined that I was a liar because I didn't tell my female friend, but I told my sexual assault counselor. For this week tax dodger comes to mind. Looks like i'm on baby sitting duty again . No, not really. The new grads always seems to get crazy around this time of the year. The newbies always get crazy during a full moon. Oh, it's Halloween already ? They don't pay us enough for this. What do you think of when you hear Donald Trump . For me it's Racist, embarrassment, disgrace and shame. What about you ? Snowflakism: Is this a genetic trait, or learned behavior? Looking at Donald Trump makes me wonder this very same question everyday . The farmers in the south tell a different story, since they are going broke. I hope we don't get tried of winning and don't forget than dumb parade The Don wanted to throw. Minimum wage to $15.00/hr are you kidding me??? I'll give you three more wishes, if you make a wish for me to get affordable health care. 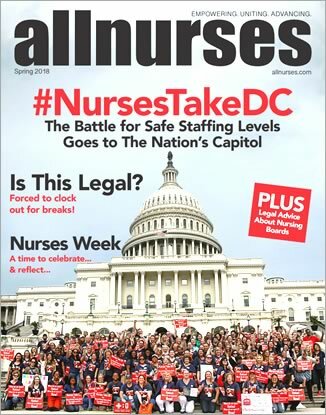 Any nurses here write fanfictions ? She is paid to write them fanfics? Wow I wish I was in that position. I love writing, I'm not great at it ,but I have improved. I will give you a link to my fanfic if you like reading anime . One of these days I might join a role play on here .